Tajic is basically a combination of several abilities that are good for aggressive, creature based decks. But considering how laser-focused on attacking Boros has become over the course of the last two Ravnica blocks, that’s kind of a good thing. Even if he just attacks out of nowhere and messes up combat math with his own power and his mentor ability, that’s already pretty good. I’d especially like to point out that his ability to prevent non-combat damage is not in fact only when creatures are attacking or something like that – we’re used to the battalion ability from Return to Ravnica, and you might expect a powerful ability like that to be more conditional, but it’s not. It doesn’t help the battalion creatures in combat per se, but protecting his colleagues from Lightning Strike, Flametongue Kavu, Sweltering Suns, and even Vulshok Sorcerer is far from trivial and occasionally game-breaking. Tajic feels a bit pushed, doesn’t he. A 3/2 with haste and mentor is already promising, and that’s before you get to his other two abilities. On turn 3, Tajic is likely adding 4 power onto the board and swinging, which is a very good rate of return. He’s even decent late, as being able to get first strike lets him muscle through blockers a bit better (and lets him block even better than before). 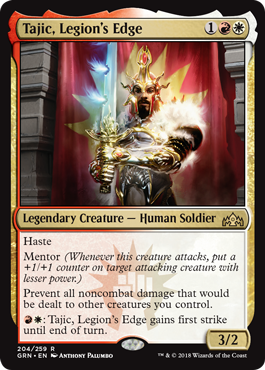 He wants to be attacking with mentor as back-up, though, and a steady stream of counters to smaller creatures is a good place to be. His other ability is a bit more subtle, but one I like a lot: a pseudo-Dolmen Gate effect for other creatures. While a board wipe will take out Tajic, if it’s a damage-based wipe, it won’t take out your other creatures! 2 toughness is not going to hold up especially well, but forcing him to be removed to take out the rest of your board is a nice layer of protection that I can see a number of decks making use of.